Inhibition of NFκB: a future strategy to restore endocrine sensitivity? Endocrine therapy is a commonly used treatment for estrogen receptor (ER)-positive breast cancer. Although endocrine therapy has a favorable outcome in many patients, development of resistance is common. Recent studies have shown that NFκB, a transcription factor regulating a wide variety of cellular processes, might play a role in the development of endocrine resistance. The precise interaction between ER and NFκB and how this contributes to the attenuated responsiveness of ER-positive breast cancer cells to hormonal treatment remains unclear. 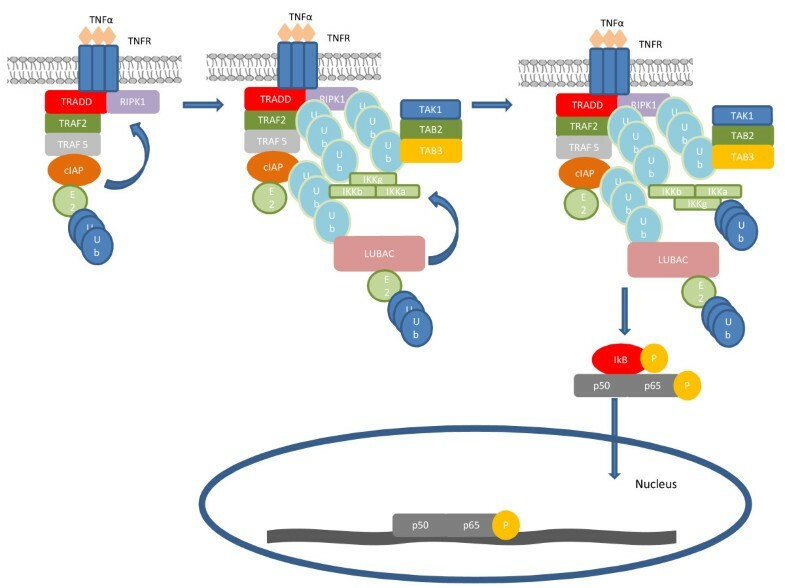 This review provides an overview of the mechanisms of action for both transcription factors and focuses on the current knowledge explaining how ER and NFκB affect each other's activity and how this cross-talk might contribute to the development of an endocrine resistance phenotype in breast cancer cells. Breast cancer is one of the leading causes of cancer-related death in women. Gene expression profiling studies have shown that breast cancer is a heterogeneous disease consisting of at least five subtypes [1, 2]. Independent studies have shown that the estrogen receptor (ER) signaling pathway, tumor cell proliferation and epidermal growth factor receptor/ErbB2 amplification are the main drivers for breast cancer heterogeneity [3, 4]. Overall, the two major sub groups of breast cancer that can be distinguished are stratified according to their ER status. The ER-positive breast tumors are referred to as luminal tumors, indicating that these tumors supposedly originate in the luminal cell layer of the breast gland. The group of luminal tumors can be subdivided into luminal A and luminal B tumors, based on differences in expression for a series of luminal genes (attenuated in the luminal B tumors) and proliferation genes (overexpressed in the luminal B tumors). Evidence suggests that the strongly proliferating luminal B-type tumor cells are less responsive to endocrine therapy, which is the mainstay of treatment for patients with ER-positive breast cancer. Fan and colleagues have shown that approximately 90% of the patients with luminal B-type tumors exhibit a high recurrence score, which indicates that these patients bear tamoxifen-resistant tumors [5, 6]. Keeping in mind the already established relationship between endocrine therapy resistance and activated growth factor signaling pathways (for example, mitogen-activated protein kinase or phosphatidylinositol-3 kinase), which contribute to cell proliferation, this observation is not unexpected. Activated growth factor signaling is believed either to downregulate ER protein expression or to enhance ER activity in a ligand-independent manner and, as such, provides a means for tumor cells to escape from the inhibitory actions of the anti-estrogens [7–10]. On the other hand, Fan and colleagues also demonstrated that up to 30% of the patients with luminal A-type tumors exhibit high recurrence scores . Given the fact that luminal A-type breast tumors are generally slowly proliferating tumors, these data suggest that other factors contribute to the attenuated responsiveness of ER-positive breast cancer cells to endocrine therapy and therefore these factors may be potential targets for modulating endocrine responsiveness. Recent data have demonstrated that the activity of NFκB, a transcription factor promoting expression of genes related to several oncogenic processes, is linked with ER signaling in breast cancer cells, although the exact nature of the interaction remains vague [11, 12]. Several studies have suggested that ER and NFκB may attenuate each other's activities. Inhibition of ER by anti-estrogens might thus release NFκB from ER-driven inhibition, resulting in NFκB-driven tumor progression. Vice versa, NFκB may downregulate ER expression or attenuate its activity, giving rise to ER-negative or ER-irresponsive cell populations that are naturally resistant to endocrine therapy. In contrast, other studies have suggested a synergy between ER and NFκB activity, leading to the transcription of genes involved in aggressive tumor cell behavior, such as multidrug resistance proteins and prosurvival factors. Of note, NFκB can also be stimulated by growth factor signaling pathways such as mitogen-activated protein kinase and phosphatidylinositol-3 kinase, suggesting an intricate interplay between ER, NFκB, mitogen-activated protein kinase and phosphatidylinositol-3 kinase in mediating resistance to endocrine therapy. This review summarizes the currently available data and explores how the crosstalk between ER and NFκB might affect endocrine responsiveness. Throughout the following text, ER refers to ERα. ER is a transcription factor belonging to the group of nuclear receptors that can be activated upon binding of estradiol. Two isoforms of ER exist, ERα and ERβ, which are encoded by two distinct genes (ESR1 and ESR2). Both ERα and ERβ proteins consist of five functional domains (Figure 1a) that share a high degree of sequence homology [13, 14]. Wild-type ERα is composed of 595 amino acids and has a molecular weight of 66 kDa, whereas wild-type ERβ is composed of 530 amino acids and has a molecular weight of 59 kDa [13, 15]. Functionally, the role of ERα in mediating gene transcription is well documented, and studies using mouse models and human breast (cancer) cell lines have shown that ERα plays a role in, amongst other processes, cell proliferation. In contrast, the role of ERβ as a transcriptional regulator remains ambiguous. Studies suggest that ERβ can attenuate the activity of ERα, potentially through heterodimerization [14, 16]. Estrogen receptor functional domains and signal transduction schemes. (a) Different domains of estrogen receptor (ER). Both ERα and ERβ isoforms consist of five functional domains: an N-terminal A/B domain, a DNA binding domain (DBD), a hinge domain, a ligand binding domain (LBD) and a C-terminal domain. The A/B domain contains a constitutively active, estrogen-independent, transcriptional activation domain (activation function 1 (AF1)) and is involved in co-activator binding and transcriptional activation of target genes. The DBD contains two zinc finger motives by which binding of the receptor to the estrogen response elements (ERE) of target genes is mediated. This domain contributes to dimerization and activation of the receptor. The LBD consists of 12 α-helices that form a hydrophobic pocket, responsible for ligand binding. In addition, the LBD contains an estrogen-responsive transcriptional activation domain (activation function 2 (AF2)). The region between the LBD and the DBD is called the hinge region. Finally, the C-terminal domain is probably involved in differentiating between agonists and antagonists. (b) ER signal pathway. In the classical genomic pathway, ER binds directly to the DNA. Estradiol (E2) binds to ER, which induces the release of heat shock protein (hsp) 90. ER dimerizes and translocates to the nucleus, where it can bind to EREs. The nonclassical genomic pathway differs from the classical genomic signaling pathway in that ER does not bind to the DNA directly, but the ER dimer interacts with other transcription factors that bind to the DNA. As such, other subsets of genes are regulated. In the nongenomic pathway, ER does not stimulate transcription by binding to the DNA but ER activates a subset of secondary signaling pathways: ER binds to the p85α regulator subunit leading to activation of phosphatidylinositol-3 kinase (PI3K)/Akt. Another mechanism in which ERa regulates the cell in a nongenomic signaling pathway is by activating Ras, which activates the mitogen-activated protein kinase (MAPK) and PI3K signaling pathway. MEKK, MAPK/Erk kinase; P, Phosphogroup; RAF, RAF proto-oncogene serine/threonine-protein kinase; RAS, Rat sarcoma; TF, transcription factor. Estrogenic actions can be mediated through classical and nonclassical ER signaling pathways, which are extensively reviewed by Barone and colleagues . Briefly, classical signaling is initiated by the binding of estrogen to ER, causing the receptor to bind directly to estrogen receptor response elements - regions of DNA located within the transcriptional start sites of estrogen-regulated genes - and subsequently activating transcription of downstream genes. There are several mechanisms of nonclassical ER signaling. The first of these mechanisms is mediated by signaling of growth factors (for example, insulin-like growth factor and epidermal growth factor) and G-protein coupled receptors, through downstream signaling molecules to ER. 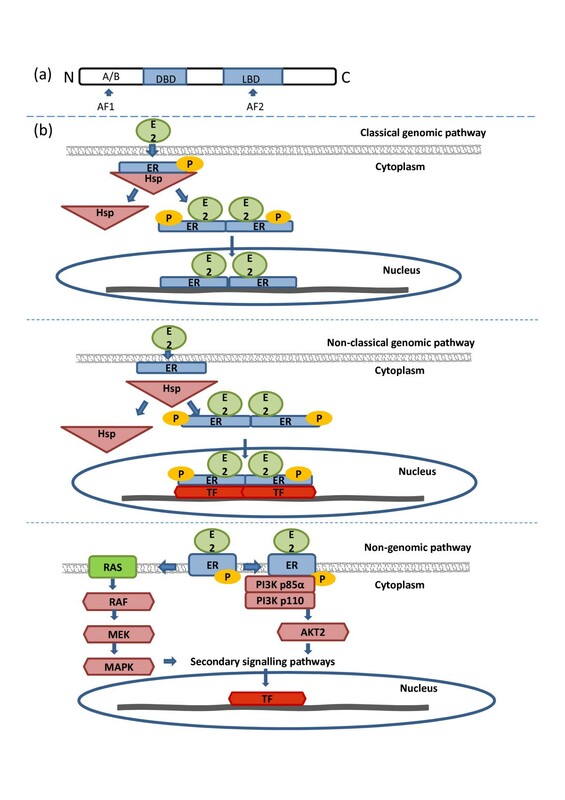 These pathways modulate the post-transcriptional modification (that is, phosphorylation, acetylation or methylation) of ER, and thus its activity independent of estrogen binding. A second form of nonclassical signaling requires the binding of ER to other transcription factors (including specificity protein 1 and activator protein 1), causing recruitment of ER to transcriptional start sites other than estrogen response elements and transcription of downstream genes. Finally, signaling has also been shown to occur through truncated membrane-bound forms of ER, resulting in the inhibition of full-length ER activity . ER-mediated signal transduction schemes are outlined in Figure 1b. Endocrine therapy is one of the major modalities of medical treatment for patients with ER-positive breast cancer. This therapy involves the manipulation of the endocrine system through exogenous administration of drugs that inhibit the production of or the activity of estrogen. Three groups of anti-estrogen drugs can be discerned: selective estrogen receptor modulators (SERMs), selective estrogen receptor downregulators (SERDs) and aromatase inhibitors. Examples of each category are summarized in Table 1. Both SERMs and SERDs affect ER directly, either by direct competition with the ligand for binding to ER (that is, SERMs) or by downregulating ER protein expression levels (that is, SERDs). Upon binding of a SERM to ER, the transcription factor is still allowed to bind to DNA but the initiation of transcription is inhibited due to an insufficient conformation change of the receptor. The second group of anti-estrogen drugs (that is, SERDs) acts by inducing a conformational change of ER that reduces the ability of ER to modulate gene transcription and promotes ER for degradation by the proteasome [18, 19]. The last category of endocrine therapeutics is the aromatase inhibitors, which function by preventing the conversion of androgens into estrogens by inhibiting the aromatase enzyme, leading to lowered concentrations of ER ligand and thus attenuated ER activation [20, 21]. Although endocrine therapy is highly effective in patients with ER-positive breast cancer, some patients with ER-positive breast cancer show de novo resistance to endocrine therapy whereas others initially benefit but ultimately relapse with acquired endocrine resistance [22, 23]. Putative molecular mechanisms responsible for de novo or acquired resistance to endocrine therapy are summarized in Table 2. AIB1, amplified in breast 1; AP1, activator protein 1; CYP450, cytochrome p450; EGFR, epidermal growth factor receptor; ER, estrogen receptor; FGFR, fibroblast growth factor receptor; FKBPL, FK506-binding protein like; HSP90, heat shock protein 90; IGF1-R, insulin-like growth factor-1 receptor; MAPK, mitogen-activated protein kinase; NCOR1, co-repressor of estrogen receptor; PI3K, phosphatidylinositol-3 kinase. One of the most intensively studied areas related to endocrine therapy resistance involves the interaction with growth factor signaling pathways such as epidermal growth factor receptor/ErbB2, insulin-like growth factor-1 receptor and fibroblast growth factor receptor [9, 23–26]. Enhanced growth factor signaling activates both the genomic and nongenomic pathways of ER where as most anti-estrogen drugs suppress the ER genomic actions only . Evidence based on cell-line experiments suggests that the attenuation of growth factor signaling is able to overcome endocrine therapy resistance . In addition, growth factor signaling results in deregulated expression of cell cycle stimulating genes (cyclin D, cyclin E, MYC) or repression of the cyclin-dependent kinase inhibitors p21 or p27, leading to ER-independent cell proliferation . A second mechanism of endocrine therapy resistance involves the deregulated expression of co-regulators, particularly when dealing with SERMs. Overexpression of AIB1, a steroid receptor co-activator amplified in breast cancer, causes a reduction of the antagonistic effects of tamoxifen on ER. In contrast, overexpression of NCOR1, a co-repressor of ER, is associated with enhanced responsiveness to tamoxifen [29–31]. Other mechanisms contributing to resistance to endocrine therapy involve mutations in the genes encoding ERα or CYP450 (that is, cytochrome p450 that converts tamoxifen to its active metabolite), ERα splice variants, enhanced ERβ expression and increased activity of transcription factors such as activator protein 1 and NFκB [23, 32–34]. The remaining parts of the present review will focus on how the interaction between NFκB and ER affects the cellular response to endocrine therapy. The family of NFκB transcription factors constitutes five members (that is, RelA or p65, RelB, cRel, NFκB1 or p50, and NFκB2 or p52), which all play a prominent role in cellular homeostasis . NFκB1 and NFκB2 are synthesized as larger precursors (p105 and p100, respectively) that are partially degraded upon activation to acquire their mature forms (p50 and p52, respectively). All NFκB family members share a highly conserved Rel homology domain in their N-terminus, which is responsible for dimerization, nuclear translocation, DNA binding and association with the inhibitor of NFκB (IκB) proteins [35, 36]. RelA, RelB and cRel proteins have a transactivation domain at the C-terminus, while NFκB1 and NFκB2 proteins have a large inhibitory C-terminal domain with multiple ankyrin repeats. This inhibitory domain is partially, but not completely, degraded upon activation, resulting in the mature NFκB1 and NFκB2 proteins. To activate gene transcription, the mature NFκB proteins form various homodimers and hetero-dimers that are able to bind to DNA at specific NFκB response elements. However, not all homodimers and heterodimers can activate gene transcription to a similar extent. The existing NFκB dimers and their DNA binding capacity have been extensively described elsewhere [37–40]. Different stimuli induce activation of NFκB, including inflammatory cytokines (IL-1, lipopolysaccharide and TNFα), extracellular chemical stresses and growth stimuli . Activation of NFκB is obtained through either the canonical pathway (Figures 2 and 3) or the noncanonical pathway (Figure 4), both of which are discussed in detail elsewhere . In the canonical NFκB pathway, NFκB dimers (mainly RelA/NFκB1) are sequestered in the cytoplasm through their assembly with the inhibitor of NFκB α-protein (IκBα). After cellular activation, IκBα is phosphorylated by a macromolecular complex containing inhibitor of NFκB kinase 1 (IKK1) (IKKα), IKK2 (IKKβ) and NEMO (IKKγ). Phosphorylation of IκB proteins stimulates the rapid ubiquitylation and degradation of this cytoplasmic inhibitor by the 26S proteasome complex, liberating the NFκB heterodimer and unmasking the nuclear localization signals to promote the rapid translocation of the NFκB complex into the nucleus. A parallel noncanonical pathway for stimulus-coupled activation of specific REL proteins exists, with preference for the RelB/NFκB2 dimer. This path way involves the inducible proteolytic processing of the NFκB2 gene product, p100. Different members of the TNF-receptor superfamily, such as B-cell activating factor and CD40, selectively activate the NFκB-inducing kinase and IKK1, leading to the phosphorylation of p100, followed by its ubiquitylation, and partial proteolytic processing in the 26S proteasome yielding p52 [39, 40]. Canonical activation of NFkB by Toll-like receptor and IL-1 receptor. The family of Toll-like receptors (TLRs) comprises 13 members, of which TLR4, TLR5, TLR7 and TLR9 are the most important. All TLRs have leucine-rich repeat motifs in their extracellular domain, which recognize distinct microbial patterns such as lipopolysaccharide, flaggellin, viral double-stranded RNA and unmethylated CpG motifs. The IL-1 receptor subfamily is characterized by immunoglobin-like structures in their extracellular binding domain. Generally, binding of the ligand to the TLR or to IL-1 receptor (IL-1R) activates the receptor and leads to the recruitment of adaptor proteins like myeloid differentiation primary response gene 88 (MyD88). Next, MyD88 recruits downstream adaptor molecules like IL-1 receptor-associated kinase 1 and 4 (IRAK1 and IRAK4). IRAK4 is autophosphorylated and phosphorylates IRAK1. 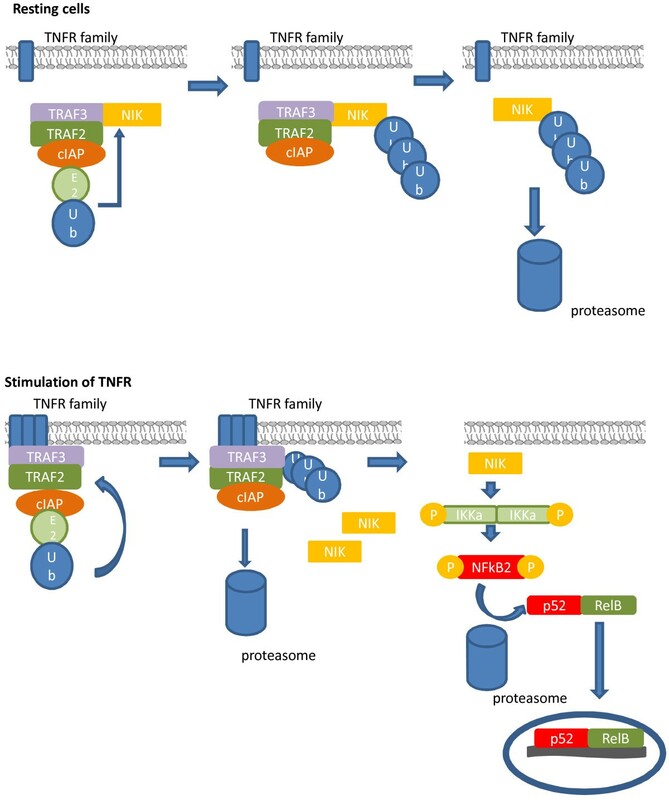 Activation of IRAK1 allows binding of TNF receptor-associated factor 6 (TRAF6) to the complex. Further, the conformation of the complex changes, which leads to release of the IRAK1-TRAF6 complex from the receptor complex and the association with another membrane-associated complex, composed of transforming growth factor-beta activated kinase-1 (TAK1), TAK1-binding protein 1 (TAB1) and TAB2. Subsequently, TAB2 and TAK1 are phosphorylated and, together with TRAF6 and TAB1, these two units are translocated into the cytosol. IRAK1 is poly-ubiquitinated and degraded by the proteasome. In the cytoplasm, TRAF6 associates with Ubc13/Uev1A, which is an E2 ubiquitin-conjugating enzyme complex. 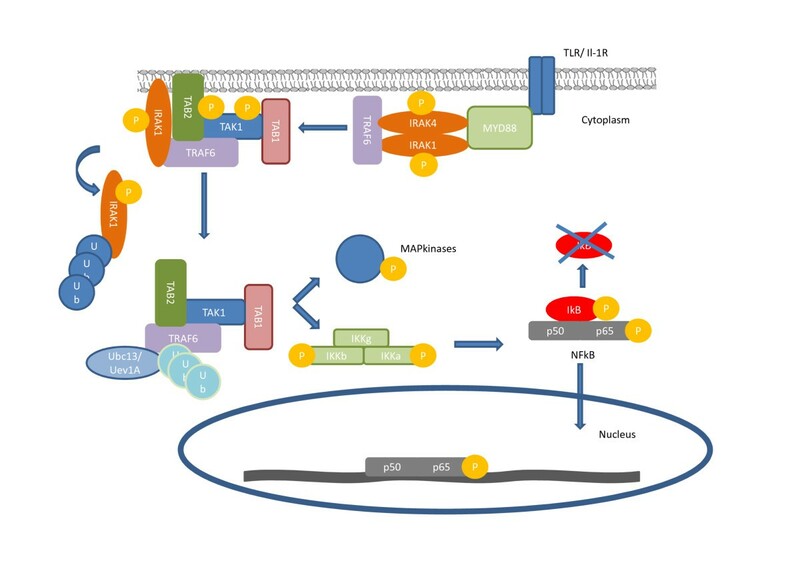 K63-linked poly-ubiquitination of TRAF6 is necessary for binding to and activation of TAK1, which in turn phosphorylates and activates inhibitor of NFκB kinases (IKK) and stimulates a c-Jun NH2-terminal kinase (JNK). Inhibitor of NF B a-protein (IκBα) is degraded and NFκB is free to translocate to the nucleus. As such, NFκB is able to regulate gene transcription. MAP, mitogen-activated protein; P, phosphogroup; Ub, ubiquitin. Canonical activation of NFκB by TNF receptor. Binding of TNFα to TNF receptor 1 (TNFR1) leads to recruitment of the adaptor protein TNF receptor superfamily member 1A associated via death domain (TRADD), the ubiquitin ligases TNF receptor-associated factors 2 and 5 (TRAF2 and TRAF5), the inhibitor of apoptosis proteins cellular inhibitors of apoptosis 1 and 2 (cIAP1 and cIAP2), and the protein kinase RIPK1. This complex is also known as complex 1. The components of complex 1 are K63-ubiquitinated by cIAP1. This ubiquitination stimulates the ubiquitination-dependent recruitment of the linear ubiquitin chain assemblage complex (LUBAC) and the complexes composed of the kinases TAK1-TAB2-TAB3 and IKKα -IKKβ-IKKγ . LUBAC stimulates the formation of poly-ubiquitin chains on IKKγ and other members of the complex, with stabilization of the complex as a consequence. Besides, ubiquitination is necessary for the recruitment, retention, and activation of IKKα-IKKβ-IKKγ by TAK1. Next, IKKβ phosphorylates IκB, which leads to ubiquitin-dependent proteasomal degradation of IκB and activation of NFκB. E2, estradiol; IκB, inhibitor of NFκB; IKK, inhibitor of NFκB kinases; P, phosphogroup; TAB, TAK1-binding protein 1; TAK, transforming growth factor-beta activated kinase-1; Ub, ubiquitin. Noncanonical activation of NFκB. NFκB-inducing kinase (NIK) activates the noncanonical pathway of NFκB. In resting cells, NIK is ubiquitinated by a ubiquitin-ligase complex, composed of TRAF3-TRAF2-cIAP1 and/or cIAP2, and is proteasomally degraded. Stimulation of the receptor by a ligand of the TNF receptor (TNFR) family, such as CD40, B-cell activating factor, receptor lymphotoxin-α, receptor activator for NFκB and TNFR2, leads to recruitment of the TRAF3-TRAF2-cIAP complex to the receptor. TRAF3 is ubiquitinated in a cIAP-dependent manner and further degraded by the proteasome. This loss of TRAF3 prevents binding of NIK to the ubiquitin-ligase complex. NIK can escape from ubiquitination and subsequent degradation resulting in accumulation in the cytosol. This allows NIK to activate inhibitor of NFκB kinases a (IKKα) by phosphorylating serine 176 and serine 180. Subsequently, IKKα phosphorylates NFKB2. This allows ubiquitination and partial degradation of NFκB2 to p52. The C-terminal ankyrin repeats of NFκB2 are degraded. This allows NFκB2 to form dimers with RelB and to translocate to the nucleus. The noncanonical pathway can be activated by members of the TNF receptor superfamily. CIAP, cellular inhibitors of apoptosis; E2, estradiol; P, phosphogroup; TRAF, TNF receptor-associated factor; Ub, ubiquitin. The role of NFκB in tumor biology has recently been described extensively . When focusing on the hallmarks of cancer , it is evident that NFκB is able to regulate nearly every aspect of tumor biology, including the promotion of cell survival, the induction of cell proliferation, the promotion of metastasis and the stimulation of angiogenesis. In breast cancer, many studies demonstrated the role of NFκB in the induction of epithelial-to-mesenchymal transition, a process implicated in the acquisition of a motile and invasive cancer cell phenotype . Breast cancer cells undergoing epithelial-to-mesenchymal transition additionally gain stem cell properties, allowing them to withstand the detrimental effects of (chemo)therapeutics . In addition, recent evidence suggests that NFκB integrates proinflammatory cues from the tumor microenvironment to regulate these cellular dynamics . In this context, inflammatory breast cancer (IBC), an aggressive form of locally advanced breast cancer with elevated invasive and metastatic potential, is particularly of interest. We have shown that NFκB is hyperactive in IBC . In addition, we and others have shown that IBC tumor cells are generally characterized by stem cell characteristics, more than tumor cells from non-IBC . The interaction between ER and NFκB in breast cancer has been the topic of several studies. Overall, the activation profiles of both transcription factors are inversely correlated [11, 12, 47, 49–54]. Biswas and colleagues demonstrated that NFκB activation is detected predominantly in ER-negative breast tumors, and preferentially in those with additional epidermal growth factor receptor/ErbB2 amplification . In line with these results, Zhou and colleagues have shown that the levels of NFκB DNA binding in patients with breast cancer are inversely correlated with the cellular ER concentration . Similarly, our research group has shown that NFκB target gene expression is most pronounced in breast tumor samples from patients with low ER target gene expression . In addition, using publicly available gene expression data from 78 breast cancer cell lines covering all molecular breast cancer subtypes, we revealed a highly significant negative correlation between the expression of a published NFκB activation signature  in these cell lines and the ER activity score generated using the PAM50 algorithm . Similar results were obtained when analyzing publicly available gene expression data from 2,420 human breast cancer samples (unpublished data). The observed inhibitory interaction between ER activity and NFκB activity in human tissue samples is mechanistically corroborated by data originating from cell-line experiments. In the ER-positive breast cancer cell lines T47D and MCF7, Qiu and colleagues demonstrated that Toll-like receptor-9-mediated attenuation of ER activity and ER-mediated induction of cell proliferation were reversed by addition of the NFκB inhibitor BAY11-7082 . In addition, Paimela and colleagues demonstrated in human retinal pigment epithelial cells that Toll-like receptor-4-mediated NFκB activation and induction of NFκB target gene expression are counteracted by the addition of estradiol, suggesting that the inhibitory interaction between both transcription factors is reciprocal . The mechanisms contributing to this reciprocal inhibitory interaction are summarized in Figure 5. Recent studies have provided data to explain the repression of NFκB activity by ER. First, ER can prevent NFκB DNA binding as shown in the study of Paimela and colleagues using human retinal pigment epithelial cells . These data corroborate previous work by Galien and Garcia, who have shown that ER prevents binding of c-Rel and RelA to the promoter of IL-6 in different cancer cell lines including HeLa cells, human breast tumor-derived MCF7 cells and human osteosarcoma-derived Saos2 cells . A possible mechanism explaining the inhibition of NFκB DNA binding involves the interaction of ER with the Rel homology domain of NFκB. Transrepression of estrogen receptor and NFκB. (a) NFκB can inhibit estrogen receptor (ER) in different ways. Activation of Akt can inhibit the activity of forkhead box O3 (FOXO3A). This protein has an important role in the synthesis of ER. Consequently, blocking FOXO3A activity leads to a reduction in the transcription of ER. Another mechanism by which NFκB can inhibit ER is by stimulating enhancer of zeste homolog 2 (EZH2) activity, which in turn will inhibit ER. Finally, NFκB (RelB) can also inhibit ER transcription by upregulating Blimp1. (b) Besides the repression of ER by NFκB, ER is also able to repress NFκB. One mechanism to block nuclear translocation of NFκB is by increasing the transcription of NFκB subunit p105, which is located into the cytosol until it is partially degraded. Activation of the phosphatidylinositol-3 kinase (PI3K) signaling pathway could also lead to accumulation of NFκB in the cytosol. A second mechanism by which ER inhibits NFκB activity is by preventing binding of the transcription factor to the DNA. In addition, NFκB activity is counteracted by the increased interaction with co-repressors and a competition for co-activators with ER. E2, estradiol. Second, Ghisletti and colleagues reported that activated ER inhibits nuclear translocation of RelA through the nongenomic signaling pathway of ER via phosphatidyl-inositol-3 kinase in microglia cells, but not in MCF7 epithelial cells or neuronal SK-ER3 cells . A study by Hsu and colleagues showed that 17β-estradiol inhibits NFκB activation by increasing the level of the p105 subunit in MCF7 breast cancer cell lines, which blocks nuclear translocation of NFκB due to the presence of the ankyrin repeats at the C-terminus of p105 . Interestingly, Dai and colleagues have shown in mouse spleno-cytes that ER-mediated inhibition of nuclear translocation does not affect all NFκB family members, but only those harboring a transactivation domain (RelA, RelB and c-Rel) . A third mechanism relates to the interaction of ER with transcriptional enhancers or repressors, leading to a less potent induction of NFκB transcription. For example, research using MCF7 cells and primary osteoblasts showed that ER can compete with NFκB for binding with transcriptional co-activators (for example, CREB-binding protein) or that ER is able to recruit co-repressors (for example, glucocorticoid receptor interacting protein 1) to NFκB complexes [53, 60]. Lastly, Wang and colleagues have shown that ER can inhibit de novo RelB synthesis in breast cancer tissue and cell lines, suggesting that ER can regulate the NFκB pathway at the transcriptional level of its constituents . Data explaining the repression of ER activity by NFκB have thus far been less abundant. A mechanism explaining the link between induction of NFκB activation and concomitant repression of ER activation is provided by Belguise and Sonenshein, who have shown that protein kinase Cθ, which induces c-Rel activity in murine cell lines, also stimulates AKT. This stimulation in turn inactivates forkhead box O protein 3a, leading to decreased synthesis of ER . A second possible mechanism involves the enhancer of zeste homolog 2 (EZH2), which is activated by TNFa in an NFκB -dependent manner . EZH2 is a member of the polycomb repressor complex 2 and regulates gene expression via trimethyla-tion of lysine 27 on histone 3. Silencing of EZH2 in breast cancer cell lines leads to a nearly twofold increased expression of ER , suggesting that EZH2 activation secondary to NFκB activation may be involved in silencing of ER expression. Finally, NFκB - and more specifically RelB - is able to repress ER expression by means of BLIMP1, a zinc finger protein that inhibits ER transcription . Although the majority of studies suggest a reciprocal inhibition between ER and NFκB, some studies have demonstrated a positive cross-talk between both transcription factors [65–67]. Frasor and colleagues performed a gene expression profiling study on ER-positive MCF-7 breast cancer cells, treated with 17β-estradiol (that is, ER activation), TNFα (that is, NFκB activation), or both. Their data suggest that transrepression between ER and NFκB does occur but that positive cross-talk is more prominent . Three gene-specific patterns of regulation were discernible: NFκB -enhanced expression of ER target genes, ER-enhanced expression of NFκB target genes, and 60 genes with a more than additive up-regulation by both transcription factors. Importantly, Frasor and colleagues have also shown that the positive cross-talk between ER and NFκB does not affect all ER and NFκB target genes, suggesting dependency on additional regulatory mechanisms. The exact mechanisms by which ER and NFκB enhance each other's activity remain unclear, but data suggest that both transcription factors can stabilize each other's interaction with their respective response elements [65–67]. For example, the expression of the estrogen responsive genes ABCG2 (which encodes a multidrug transporter protein) and PTGES (which en codes the enzyme prostaglandin E synthase) is enhanced by NFκB due to the fact that NFκB stabilizes the binding of ER to its response element [65, 67]. For CCND1, encoding cyclin D1, the synergy between ER and NFκB involves a different mechanism. As the CCND1 promotor does not contain an estrogen response element, ER needs to interact with NFκB proteins that allow the binding of the complex to NFκB response elements in the promotor of CCND1. NFκB is thus required for the binding of ER to the promoter of cyclin D1 . Besides the influence of both transcription factors on each other's DNA binding capacity, other levels of interaction are hypothesized. For example, the combined stimulation of the ER and NFκB pathways might affect NFκB dimerization and shift the balance of transcriptionally inactive dimers (for example, NFκB1/NFκB1) and active dimers (for example, RelA/NFκB1) in favor of the latter . Finally, synergistic cross-talk between ER and NFκB may also result from direct interactions between alternative components of the NFκB signal transduction cascade and ER or ER co-activators. For example, IKK1 is required for the expression of estrogen-responsive genes, including CCND1 and c-Myc, by forming a complex with ER and AIB1/SRC3 that binds to the promotor of estrogen-responsive genes . In addition, IKK1 is able to phosphorylate both ER and its cofactors, thereby enhancing their activity [70–72]. IKK1 is also able to influence estrogen-mediated cell cycle progression through the regulation of E2F1 . In the past decade, several studies have focused on the role of NFκB activation in ER-positive endocrine-resistant breast cancer. When comparing tamoxifen-resistant and tamoxifen-sensitive MCF7 cells, Kim and colleagues have shown that the acquisition of a resistance phenotype is accompanied by increased levels of NF B activity . Similarly, in Akt-hyperactivated, tamoxifen-refractory MCF7 cells, increased IκB phosphorylation and NFκB DNA binding were measured . In tissue samples from patients with breast cancer, Zhou and colleagues have shown increased NFκB1 DNA binding, but not RelA DNA binding, identifying a series of patients with ER-positive breast cancer with early metastatic relapse and reduced overall survival intervals . In a follow-up study, the same authors were able to demonstrate that a three-gene signature composed of NFκB and activator protein 1 target genes is able to dichotomize node-negative ER-positive cases into early and late relapsing subsets despite adjuvant tamoxifen therapy. This observation was confirmed in four independent gene expression datasets of patients with breast cancer . In line with these data, it should be mentioned that patients with IBC with ER-positive tumor cells are virtually all resistant to endocrine therapy, a clinical observation corroborated at the molecular level by a significantly elevated recurrence score in ER-positive IBC samples as compared with ER-positive non-IBC samples (unpublished data). These data suggest that the transrepression between ER and NFκB defines a series of patients with endocrine therapy-resistant breast cancer. In contrast to this conclusion, however, Frasor and colleagues have shown that the expression of 60 genes with a more than additive upregulation by ER and NFκB (vide supra) distinguishes a cohort of patients with poor outcome following endocrine treatment . In addition, the expression of this gene set is strongly elevated in patients with luminal B-type breast cancer, the molecular breast cancer subtype most often associated with resistance to endocrine therapy. Unpublished data from our research group corroborate earlier studies that suggest associations between altered NFκB activity and resistance to endocrine therapy in breast cancer. By comparing the expression profiles of ER-positive samples from patients with and without IBC, we were recently able to identify and validate six bio-markers for endocrine responsiveness: ABAT, ADAMDEC1, CLEC7A, ETS1, ITK and STC2. In addition, a metagene of these biomarkers appears to be an independent predictor of progression-free survival in patients with ER-positive breast cancer treated with tamoxifen (unpublished data). The expression of this metagene in 39 luminal A-type or luminal B-type breast cancer cell lines was highly correlated with the expression of the NFκB activation signature reported above . In addition, similar results were obtained when performing the same analysis using expression profiles from 1,285 ER-positive samples from patients with breast cancer. Overall, available data suggest that NFκB modulates ER activity, thereby potentially affecting the response of ER-positive (breast) tumor cells to endocrine therapy. Nevertheless, the precise mechanisms remain unclear and available data support different hypotheses, each of them offering potential explanations for endocrine treatment resistance. First, transrepression of ER by NFκB has been envisioned as a mechanism by which ER-positive breast tumor cells lose ER expression and, hence, give rise to a subpopulation of tumor cells that are resistant to endocrine treatment. These tumor cells may reside between the majority ER-positive tumor cells that are sensitive to endocrine treatment, leading to the phenomenon of initial therapy response followed by secondary (or acquired) resistance. Of note, this model possibly contributes to endocrine treatment resistance in tumor cells characterized by growth factor receptor signaling. The second model involves transrepression of NFκB by ER, which is suitable for explaining resistance to aromatase inhibitors, SERDs or estrogen withdrawal. 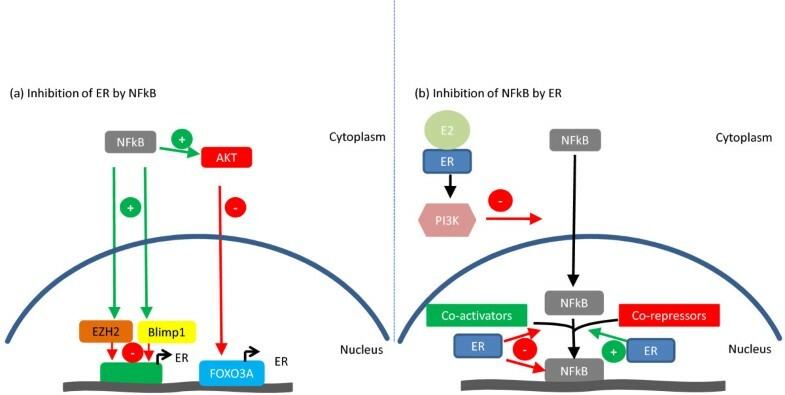 The attenuated ER activation that results from estrogen withdrawal or aromatase nhibition releases NFκB from the ER-mediated inhibition, leading to NFκB -driven tumor progression. In both of these models, the endocrine-resistant tumor cells might be characterized by an aggressive molecular profile, including expression of genes associated with epithelial-to-mesenchymal transition and stem cell biology. The last model, in which ER and NFκB enhance each other's activity, could offer an explanation for resistance to tamoxifen, which is known to exhibit agonistic properties for ER. In combination with activated NFκB, this could lead to a synergistic effect on the expression of several target genes, including anti-apoptotic genes and multidrug transporter proteins such as ABCG2. It has recently been shown that polymorphisms in the ABCG2 gene are important predictors for the prognosis of patients with breast cancer treated with tamoxifen . Although the outlined hypotheses are supported by currently available data, our knowledge related to the interaction between both transcription factors is incomplete. A first issue that needs to be taken into account involves the heterogeneous nature of breast cancer. Using gene expression profiling, Gatza and colleagues showed that up to 12 subgroups with discriminating molecular profiles can be identified in ER-positive breast cancer . This observation implies that the molecular background, which sets the scene for the interaction of ER and NFκB in breast cancer, is tremendously variable. In this context, cellular processes such as the interaction between ER and NFκB, which might depend on the presence or absence of certain cofactors or effectors of signal transduction, will vary accordingly. In contrast, the majority of the cell-line studies focusing on the interaction of ER and NFκB have used only a single model system (for example, MCF7, T47D), ignoring the heterogeneity of breast cancer and therefore obscuring the correct assessment of the role of the interaction between both molecules in breast cancer and endocrine resistance. Moreover, the expression of several components of the signal transduction cascades (for example, the I B proteins) leading to the activation of both transcription factors is tissue dependent. The interactions between ER and NFκB described in human retinal pigment epithelial cells, HeLa cells or osteo-sarcoma-derived Saos2 cells might thus be different from those observed in breast cancer cells. A second issue that needs to be considered involves the versatility of the signal transduction pathways leading to the activation of both NFκB (canonical and noncanonical) and ER (classical and nonclassical). Adding to this complexity is the fact that NFκB forms different homodimers and heterodimers upon activation. Therefore, in our opinion, it is very unlikely that one unique type of interaction between ER and NFκB exists. For example, it has been postulated that different NFκB dimers may exhibit different conformations, which has implications for the interaction between NFκB and its co-activators such as BCL3, CREB-binding protein or IRF3. In fact, the conformational changes inside the NFκB dimers also seem to be dependent on the sequence of the DNA binding site for NFκB . This observation suggests that the mode of interaction between NFκB and other proteins, such as ER, is also target gene dependent, even in the context of a single molecular background. As such, the results reported by Frasor and colleagues describing different sets of target genes that are regulated by different modes of interaction between ER and NFκB  become particularly appealing. These results imply that one should be careful when drawing conclusions about synergistic or antagonistic interactions between ER and NFκB, and the consequences thereof for resistance to endocrine therapy, based on gene expression profiling alone. Owing to the possible role of NFκB in endocrine-resistant breast cancer (vide supra), targeting NFκB might be a successful therapeutic strategy. In practice, most of the NFκB-targeting drugs prevent the proteasomal degradation of the IκB proteins, leading to cyto plasmic sequestration of NFκB. This can be achieved either by inhibiting the proteasome or by directly or indirectly (via IKK) interfering with IκBα phosphorylation. A second group of drugs interfering with NFκB activity inhibits the translocation of NFκB to the nucleus. Table 3 provides an overview of the available drugs stratified by their mechanism of action. Given the apparent role of NFκB in mediating resistance to endocrine therapy, inhibition of NFκB might be a potential strategy to resensitize tumor cells. Indeed, preclinical studies have shown that inhibition of NFκB, particularly by parthenolide or bortezomib, in breast cancer is able to restore endocrine sensitivity. Zhou and colleagues showed that NFκB inhibition by parthenolide and bortezomib is capable of sensitizing two tamoxifen-resistant ER-positive breast cancer cell lines (BT474 and MCF7/HER2). In addition, the same study also demonstrated that the resensitization results in the establishment of novel transcription factor complexes containing ER and the co-repressor NCOR1 , which is involved in regulating the responsiveness of breast cancer cell lines to tamoxifen [29, 30]. Nehra and colleagues have shown that NFκB inhibition by parthenolide in tamoxifen-resistant MCF7 cells restores responsiveness by inducing expression of caspase 8, with consequent effects on BCL2 expression, mitochondrial function and apoptosis . deGraffenried and colleagues showed that targeting NFκB, using parthenolide or the IκB super-repressor, in Akt-hyperactivated MCF7 cells restores tamoxifen sensitivity . Finally, Riggins and colleagues have shown that the administration of parthenolide to fulvestrant-resistant MCF7/LCC9 cells restores fulvestrant-induced apoptosis . To our knowledge, we are the only research group to have investigated the effect of NFκB inhibition on endocrine treatment in a clinical setting. Using patients with ER-positive breast cancer who developed metastases during endocrine treatment, Trinh and colleagues recently showed that the administration of bortezomib is able to slow down disease progression in 22% of the cases . Their study also showed that bortezomib attenuates the proteasomal activity and that the serum expression profile of IL-6 is reduced in the treated setting. Of note, most of the NFκB-targeting drugs are not NFκB specific and may affect cellular behavior through mechanisms other than NFκB inhibition. For example, the I3κB phosphorylation inhibitor BAY11-7082 also induces cell death in an NFκB-independent way by augmenting the production of reactive oxygen species leading to depolarization of the mitochondrial membrane and release of cytochrome C. With respect to the proteasome inhibition, studies have even shown these may enhance NFκB activity in an IKK-dependent manner. Altogether, these data suggest that the (clinical) use of NFκB-targeting drugs in NFκB-driven malignancies should be considered with care. Breast cancer remains an important cause of cancer-related death in women. ER-positive tumors are generally treated with endocrine therapy. One of the greatest hurdles with endocrine treatment is the development of resistance. Recent data, both in cell lines and in breast cancer patients, suggest that NFκB might play a role in modulating the ER signaling pathway and therefore could be involved in governing responsiveness to endocrine treatment in breast cancer patients. The precise mechanism, if any, remains unclear and further research exploring this intricate network is needed, especially since NFκB can be targeted with drugs and therefore might be clinically relevant. From the perspective of future research, we need to take into account the fact that breast cancer is a heterogeneous disease and that the interaction between ER and NFκB is multifaceted. Research dedicated towards unraveling this interaction should incorporate at least multiple ER-positive breast cancer cell lines and should focus on all NFκB subunits, instead of treating NFκB as a sole transcription factor. In the case of gene expression profiling, experiments should be designed to allow the discrimination of agonistic or antagonistic effects of the interaction between ER and NFκB. In addition, data obtained through gene expression profiling should be validated at protein level using DNA binding assays or electrophoretic mobility shift assays for all NFκB subunits. PBV, LYD and SJVL were involved in conceptualizing the manuscript. LS, JH and SVJL were involved in writing the manuscript. All authors were involved in carefully proofreading the paper and have approved the final version.